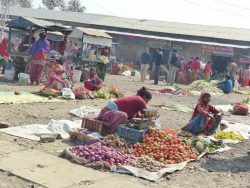 At a junction of the East-West highway, and in one of the fastest developing places in Nepal, only six kilometers (nearly four miles) from the Indian border, lies the Kohalpur agricultural market. Chabilal Bhattrai, the chair of the Market Committee, founded the Kohalpur market 13 years ago. The Village Development Committee of Kohalpur designated 1452.8 hectares (nearly 3,590 acres) of land for agriculture. Of that, 91% is used for agriculture. Kohalpur, a one hour flight from Nepal’s capital Kathmandu, is where the Data-Driven Farming Prize team started our field visit. We wanted to explore the Mid-West district, close to Nepalganjy, and learn more about key actors in the agricultural value chain in Nepal, the barriers facing them, and what factors our innovators should consider when designing their submissions to the prize. Feed the Future, America’s global hunger and food security initiative supports, via the Knowledge-based Integrated Sustainable Agriculture and Nutrition (KISAN) project efforts to sustainably improve Nepali food security and increase incomes through integrated agriculture activities. My colleague Constance and I were welcomed by the KISAN staff, and introduced to different actors across the Nepali agricultural value chain to understand what smallholder farmer needs. Our interviews painted a picture of the problems they are struggling with on a daily basis. “Before we had lower productivity,” explains Jaysing Budamagar, trader in the Market Committees. 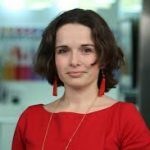 “Now productivity has increased and we need to better understand how to store produce and ensure product quality. We constantly lose 20-30% of the produce. Improving storage becomes particularly true when it comes to increasing trade with India. The quality control checkpoint on the Indian side is 100 kilometers (around 62 miles) from the border. By the time the products get there, they have spoiled, blocking opportunities to export products. Additionally, prices can vary a lot. For some vegetables, they can drop from 150 Nepali rupees to two Nepali rupees (about $1.40-$0.02 U.S. dollars) per kilogram, because there are no good track records of consumer needs. “Today, we can cultivate any type of vegetable year round. This makes it difficult to anticipate market flows. 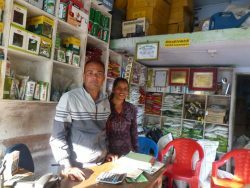 We need to know in which districts farmers are planting what, to provide better advice on what to cultivate, and when and how to make the best profit off of it,” explains Sami Chetan Aracharya, who owns an agribusiness with his wife, in Dhambojhi, Nepalganji. Sami is an engineer and he and his wife were both licensed to carry out government agricultural training before opening their business six years ago. Sami launched the business hearing requests from farmers for support and advice. In his early years as an engineer, farmers kept asking him about crops, seeds and pesticides. In response, he decided to open a storefront and advise farmers how they might increase the value of their harvests. He then also realized that farmers do not keep track of what they sell or how much they earn, so he became an advisor to farmers. “Farmers don’t like to take the risks to farm something new. I show them YouTube videos to convince them of some of new farming techniques. 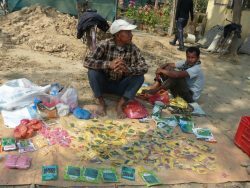 We need specialized people that farmers can trust, to provide good advice,” adds Ashok Panta, owner of an agro veterinary business in Manakaman Chauk, Ranyapur, for ten years. Currently, information is shared by informal networks, family and friends. Agribusiness owners also reach out to experts, but this can be expensive. They often use a toll-free government phone service which provides some useful information on prices and crops, but it doesn’t cover all districts, nor does it respond to all needs and it is only intermittently updated. Our conversations confirmed that new solutions capable of collecting, combining, and transferring data into actionable insights would generate great value for Nepali agricultural production. Our competitors would do well to keep in mind the barriers Nepali farmers face as they develop solutions. Only one out of five different value chain actors we interviewed use some form of smartphone application to receive agricultural information. All of them use the internet. None of the farmers use smartphones–only mobile phones–and the majority of women farmers cannot read. In short, digital solutions are be more than just applications and we encourage competitors to creatively and carefully respond to the needs of smallholder farmers and extension services.